Like the miniature books and playing cards, this is a smaller, doll-size version of an item which is also available in full-size. 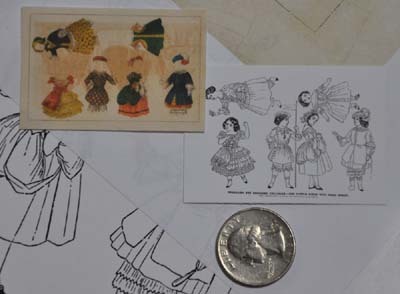 Like the other miniatures, the full-size version is shown with the miniature version (left picture) and the miniature is shown by itself (right picture). Both have a quarter shown for reference. 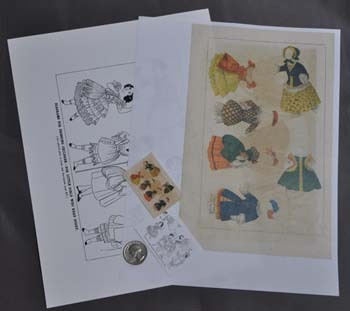 The original of these dolls appeared in the November, 1859, Godey's Magazine. To view the full-size dolls in more detail, click here. A set of these miniature dolls, which includes the handout with the reference to the source of the original in Godey's Magazine, is $1.95. If you would like both the full-size and miniatures, the combined cost is 7.95.